Lug nuts glued onto a wheel before the start of a NASCAR race. When it comes to preparing a wheel for a NASCAR pit stop, the goal is a lot like the reoccurring theme Goldilocks kept stumbling upon—the glue holding lug nuts on the wheel can’t be too brittle or too syrupy. It has to be just right, or else it could become a competition disaster. That’s might seem a little extreme, but it’s not. Glue is the only thing that holds a lug nut, a part of the car that can be just as important as the fuel or drivable tires, on a wheel. 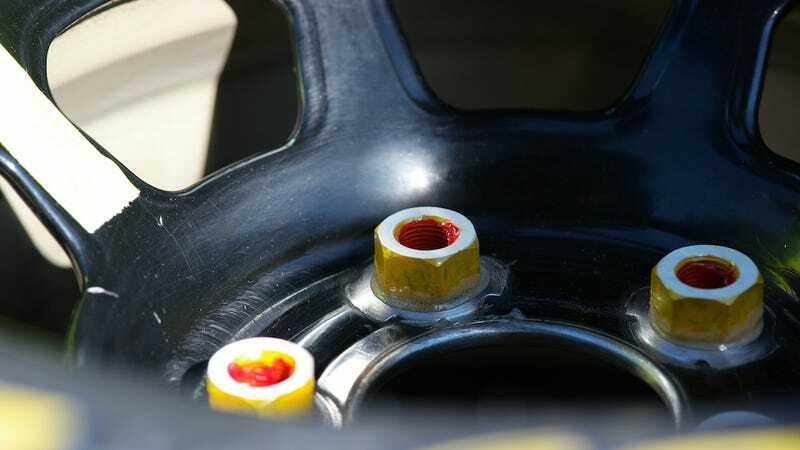 Without glue to do that job, tire changers in NASCAR would have to place a wheel on the hub, put all five lug nuts onto the wheel studs, then screw them on with a pit gun. That would take a long time, and taking a long time isn’t really what NASCAR, or any type of motorsport, wants to do—especially when NASCAR makes pit stops in the 15- and 16-second ranges, up from 11 and 12 seconds last year due to new rules on number of crew members over the wall and the standardization of equipment. But that doesn’t mean the glue solution is easy, or at all perfect. The first time I got to walk in NASCAR’s infield was when I realized pit road was just as complicated as its cars, engineering and every other aspect of the sport—when I was a young teenager and still completely in awe of racing in general. That’s when I met Colin Fambrough, who was and still is a tire changer in the top-level Monster Energy NASCAR Cup Series. He’s been on a few different teams since then, and is currently on the rear tires for Chris Buescher’s No. 37 car. He’s the tire changer as a opposed to the tire carrier, meaning he works the pit gun to take five lug nuts off of an old wheel and put five more on a new one. The No. 37 pit stall, where Fambrough works. Since he took the time out of his work day to show me around the track, be a friend, and let me hang out around the pit stall as a kid, I’ve made sure to stop by his pit box every race since then. I’ve watched him meticulously glue his tires before a race as the summer sun baked the track to temperatures well in the triple digits, and I’ve watched him fret over when to start working on them when there are rain clouds in the area. It’s a delicate science, what tire changers do, because guessing the wrong time to prepare wheels can make or break a pit stop—and while the driver always gets the glory for a win, the crew isn’t immune to bearing the blame for a loss. And in this case, it all goes back to the glue. “The glue is the only thing that holds a lug nut there,” said Fambrough, whose job is also now governed by NASCAR’s new rules that dock championship points if a majority of lug nuts aren’t tight. “The studs are threaded to a point and then at the end, the very end, they’re smooth. It’s almost like a bullet point. The tires going onto Martin Truex Jr.’s No. 56 NASCAR Cup Series car in 2011. But keeping that kind of elasticity is a moving target. If the glue is too gooey when a tire goes onto the studs, the lug nuts will just pop off like extra glitter on a school project. If it’s too dry, the glue’s hold will break. The end result is the same: lug nuts on the ground instead of on the tire, and a ruined pit stop. “If you glue up too early and it’s a really hot day and the sun is just sitting and baking these lug nuts, they’ll cure more quickly—especially if they heat up and cool down,” Fambrough said. “If they heat up, you get some cloud cover for a while, they cool down a little and they heat back up, those cycles will affect the glue. You glue up too early, the glue will become brittle and break. Getting gooey glue into the threads can slow a lug nut down as it spins off and on a wheel, and stiff glue can also pack up behind the lug nuts and keep them from getting tight. Because tire changers glue up the wheels before a race and races generally run about four hours, they have to make sure that kind of thing doesn’t affect them toward the start of the race or the end. 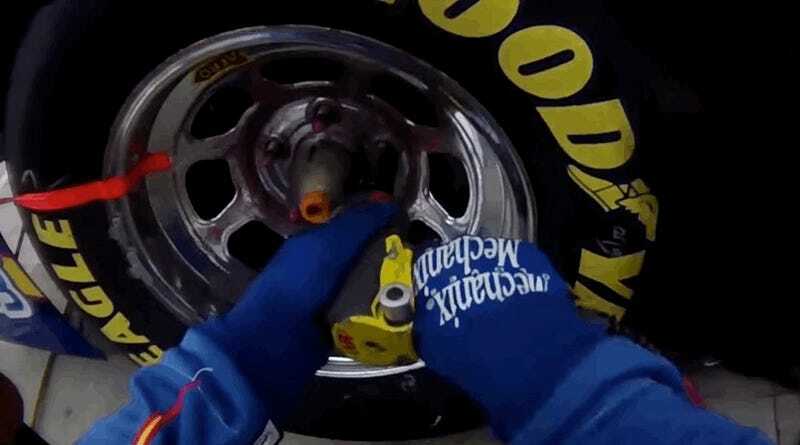 Glue on a lug nut, which a tire changer would then attach to a wheel. Fambrough said the general rule on gluing is about three hours before a race, give or take, depending on the weather. Fambrough and most other NASCAR tire changers use automotive adhesive, and he said aside from a little testing by bigger race teams, the gluing window is the result of trial and error. If the theories don’t work one particular weekend or a lug nut just gets away during a stop, most tire changers keep an extra on their helmet or glove. But Fambrough said that doesn’t come in handy some times, since instinct is often to reach for the lug nut that fell. Either method isn’t ideal on pit road, since the time it takes to get another lug nut doesn’t factor in well with the 15-second stops. The type of glue Fambrough uses on his wheels. Lug nuts don’t always fall on the ground, though. Fambrough had a lug nut pop off a few years ago, and it landed in a place where he couldn’t get to it. “When it fell, it kind of bounced around and bounced inside of one of the spokes and fell on the inside of the wheel,” said Fambrough, adding that the lug nut usually falls out and doesn’t affect a driver when that happens. “You’re not getting that. There’s no way you’re getting it. There are dozens of other situations that can make for a bad result on pit road when it comes to lug nuts, like leaving them on a wheel during a rain delay and having them rust, or having to break them off when a race gets postponed to the next day. Tire changers for smaller teams usually take affected lug nuts back to the shop for pit practice because they’re about $2 apiece, while Fambrough said teams with more money just toss them in favor of new ones. But no matter the amount of cash a team has, everyone has the same lug nuts and the same window of time before a race to prepare them. What they do with that time and equipment can make all the difference in how they do on pit road.